B Local is a unique and flexible loyalty program that facilitates local entrepreneurs in promoting their businesses while at the same time driving trade to each other for the benefit of all. Because B Local will add measurable value to your business in a way no other loyalty program can. As a participating partner you now have many other forces working with you in the form of other local businesses, B Local members and the goodwill of local customers who have a desire to support local if they are given a valid incentive. B Local is the vital link that unleashes these forces in your favour for the benefit of your business. How much will B Local membership cost? B Local membership and sign up are absolutely free for consumers. The B Local member is, and always will be, the main beneficiary. What is the cost of B Local to businesses? The cost of becoming a B Local business partner is the most affordable in the industry. The initial cost of the partner pack is €100 followed by a fee of €39 per month – less than €10 per week. B Local is for local businesses and our goal is to provide a world-class platform at a cost which is affordable for even the smallest of enterprises. Get full business pricing details here. B Local is the most transparent and cost-effective loyalty program on the market. Customers want great value and love to feel appreciated. B Local easily facilitates rewarding your loyal customers with rewards and incentives. This also gives your business an edge over your competitors. Your business will benefit with your current ( and extra ) loyal customers – spending more in your business. This ultimately, given reasonable time, leads to higher turnover and profits for your local business. Does B Local supply the scanning hardware? Yes. B Local is all inclusive and our policy is to keep the cost of entry for businesses as low as possible. The preferred B Local terminal option is a mobile android scanning device. This is available from B Local, ready to use, at €99 plus VAT. We highly recommend this customised mobile scanner as the most user friendly and efficient device. However any internet device can be used at the point of sale to scan or enter the B Local card details. Click here to learn more about B Local hardware options. How long am I tied into the program? You are not tied into anything. A card member or business partner can opt out whenever they want with immediate effect. B Local is so confident in the benefits of it’s program that there is no minimum period of membership or opt out terms and conditions. B Local members cannot lose – only win. Partner businesses will in time reap the rewards of extra customers and higher average transaction amounts. This obviously leads to higher sales and profits. Why opt out? Getting membership is fast and easy. Pick up a card at any participating partner near you. They will sign you up, there and then, in a jiffy. Your card is then activated so you can immediately avail of the B Local benefits. Will signing up a new B Local member take me long? No. With our Partner Pack and any extra order of B Local cards we also supply sign up slips. We recommend you/or sales clerk offer a sign up slip to a customer who wishes to join. They, there and then, fill in their name, email and mobile phone number. The sales clerk enters the B Local card number and the amount spent in their current transaction. Double check the email and mobile details so the writng is understood etc. This is the one chance you have to aquire this valuable information, to build your database, so it is important to ensure it is as accurate as possible. Then give them their B Local card and they can head away. You now have all the details you need to sign up the member. This can be done immediately or later at your convenience. The next time the customer visits they will have been signed up and, when they hand in their card, scanning their ( hopefully many ) future transactions only takes a few seconds. Simplcity is our strength. If I lose my B Local card? If you lose or misplace your B Local card simply pick up another one at a Participating Business. Once you give them your email address they will, there and then, activate the new card which will replace the old one. I want to know my B points balance at the participating businesses I have visited. How can I check this? To check your current B point balances or view your vouchers you can login to your private dashboard. There you can also view and edit your profile as well as browse through some other useful information. Click on Login on this website. Enter the email address you registered at B Local with, followed by your password. At sign up the default password assigned to you is 123456. You may have chosen a different password and if so you can then enter that one. You now have access to to your private dashboard. Will using B Local make it more time consuming to serve my customers? No. B Local is simple and quick to use. Once there is a reliable WiFi signal each transaction will take no longer than a few seconds from start to finish. First simply scan the customer’s B Local card or App. Their details will appear immediately. Then key in the amount they spent and hit submit. That’s it! B Local is ultra user friendly and fast. I am already a member. Can I use the same email to sign up as a business partner? Unfortunately no. The absolute privacy and confidentiality of both member and business partner data is of paramount importance to B Local. For this reason, in the interest of secure access, an email address can be used once only on our system. Most of our business partners use their business email for their business access and their personal email for their member access. What is the B Local mission statement? B Local is devoted to helping smaller local businesses in their efforts to compete successfully in an ever changing marketplace. We are passionate and vocal about the many benefits of local businesses and we want to help to safeguard their future. Local businesses need enough customers in order to safeguard this future and B Local is customer led and customer driven. B Local provides a world class digital customer loyalty program with full back up support at a price that is affordable for the smallest business. 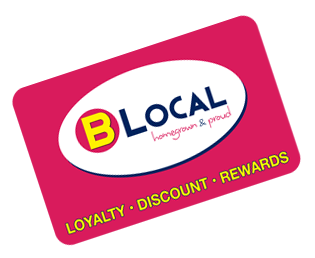 B Local, however, is much more than a loyalty program in that it easily facilitates the use of one B Local card per member that can then be used at all participating businesses. This enables local businesses to actually drive trade to each other creating the vital synergy of the many working together for the benefit of all. YES. Provided the loyalty/rewards program is user friendly for both staff and customers, all major studies reveal a rewards program is perhaps the best marketing tool a business can use to retain existing customers and attract new customers. It costs about 5 – 25 x more to acquire a new customer than it does to sell to an existing one. Not only that, but existing customers spend 60 -70% more than new customers. Customer loyalty really pays off and customer loyalty programs pay for themselves over and over again.